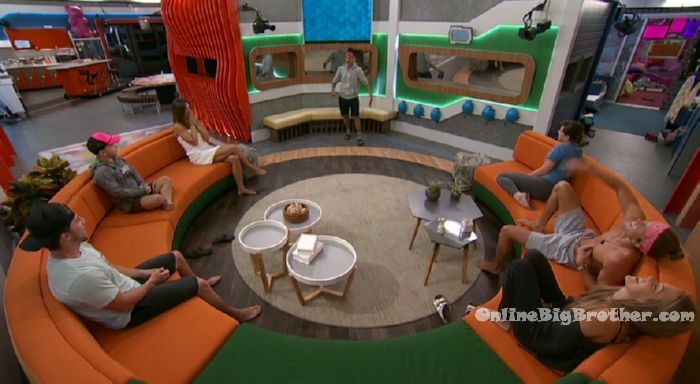 9:50pm The live feeds return. Sam – that was crazy hard. What are you going to do? Angela – I don’t know yet. I have no idea! This is the hardest one I’ve ever had to imagine. Sam – oh yeah you are pretty well at it now it is your third one! Angela & Sam head to the kitchen. They talk about how Angela won. Tyler – third HOH. You live up there. 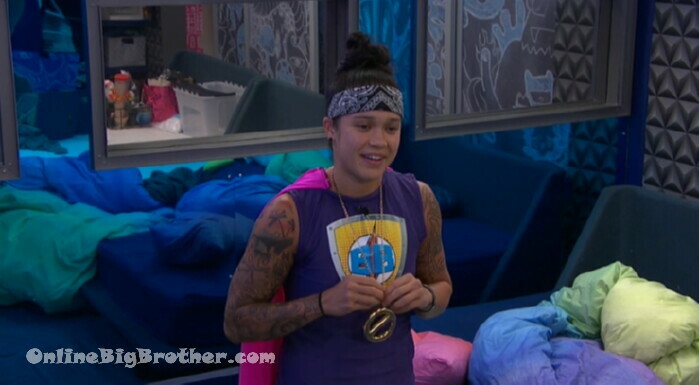 Sam – the second HOH in one day! Tyler – do you have 3 vetos? Angela – two but one that I asked for. Tyler – you earned it. Angela – three competitions in one day. JC – you did really well at them. Kaycee – maybe we’ll get the backyard tonight. 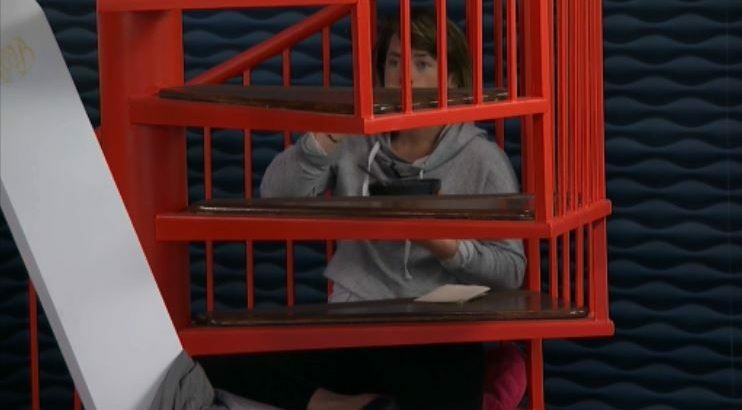 This was the week that Level 6 started to break up there was also a “i love you” for those showmance fans. One more thing to note is Haleigh thinks she was staying so expect her to be blindsided again.. Once a HIVE always a HIVE. 8:35pm Storage room. Brett & Tyler. Brett – the girls have been so good to us and I feel like they’re loyal as F**k! Tyler – I know I have been trying to test it out to see if there is any sign of them not wanting to be with us in the final four.. and they’ve never given me any.. Brett – I know, I feel like they do. And we could deviate and increase our odds but at the same point we are guaranteed if we just stick to the plan. Stay loyal, don’t stir it up. But at the same time yeah we piss off Sam and JC but the likely hood of them winning and coming back after us is so small. But at the same point .. 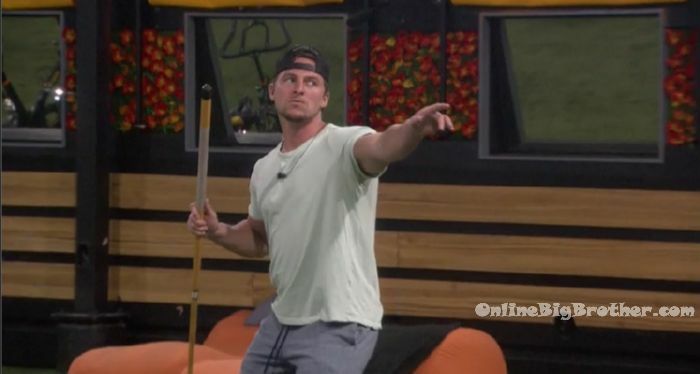 I know if we get past a couple HOH’s we’re going to beat JC and Sam. We’re going to have some bitter a$$ jury votes. Tyler – thats what.. the jury already hates us. H – I just don’t know how to do this week..